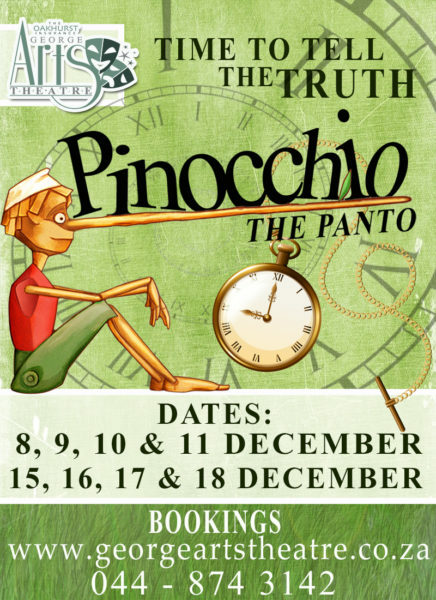 Our December show, Pinocchio the Pantomime directed by Madie Calitz at the George Arts Theatre, is coming together very nicely. With a cast made up of familiar and new faces, this show promises to be a hit. Madie is known for her comedic timing and hysterically funny shows on our stage, and directs the pantomime this year. Madie has been in many of our shows, most notably the quirky Bus Gal in “Summer Holiday”, Sidekick in “Robin Hood”. She also directed the hilarious, “As die Kat Weg is”. Her cast is made up of children and adults who are all working very hard at their dance steps and songs. What would a panto be without some of the usual topical jokes, Dames, Damsels in distress and Dastardly villains? Madie has a few surprises up her sleeve too, so don’t miss the Panto. We have catered for all affordability levels with our thursday nights being discounted to R50 for any seat in the house, no matter how big or small you are! Block bookings are also catered for, so bring your kids party to the theatre. The kids LOVE the event. We have also catered for different time frames to fit in with your holiday making schedule. Why don’t you go and book your seats online now: www.georgeartstheatre.online.